Students wait in line for La Cocinita, one of the four vendors at the first Taste of Dillo outside Deering Library on Monday. The food truck preview aimed to showcase some of the food that will be served during Dillo Day. In preparation for Dillo Day, some sample the artists’ tracks and others sample vendors’ bites. 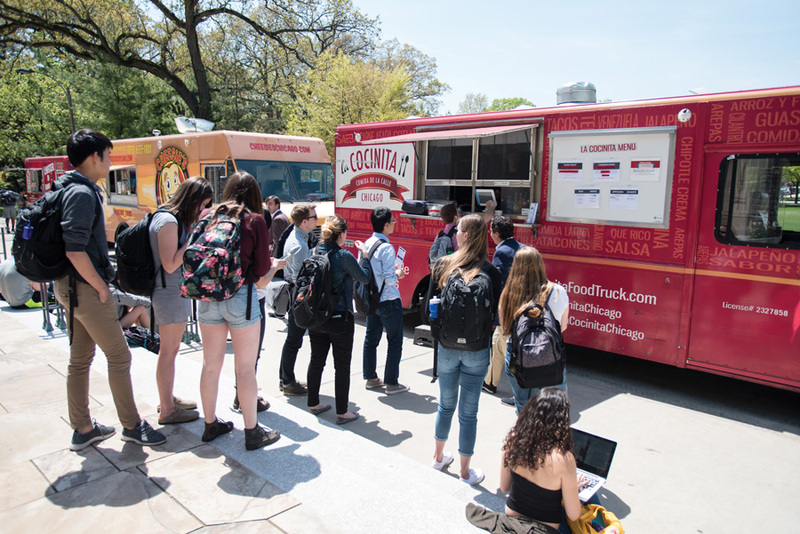 Food trucks lined up in front of Deering Library on Monday for Mayfest’s Taste of Dillo, the first food truck preview in Dillo Day history, said Kyle Austin, Mayfest’s director of programming. The preview was incorporated as a replacement for a sing-along event held in past years, which had been “generally unsuccessful,” the Weinberg junior said. The vendors were local Evanston restaurants La Cocinita and Cheesie’s Pub and Grub, Chicago-based eatery Da Lobsta and Northwestern startup BrewBike. All except La Cocinita will serve Dillo Day attendees this Saturday, Austin said. Five additional food trucks from other vendors will round out the Dillo Day selection, he said. Food trucks have been a part of Dillo Day since 2012. Since then, Austin said Mayfest has brought eight or nine trucks to the Lakefill each year. Mayfest’s food liaisons try to bring in a variety of “different types of foods and styles,” he said. Mayfest also raffled off three Dillo Day guest wristbands for people who bought food at Taste of Dillo, Austin said. SESP senior Brynn McKenna said she was drawn to the event due to the “trendy” nature of food trucks. The convenience of food trucks is also essential for students, she said. “It’s fun to have them come on campus so you can be with other students and hang out on campus, and be able to run to class five minutes away instead of being all the way in Evanston,” McKenna said. McKenna pointed out that one of the vendors, Da Lobsta, does not have a storefront in Evanston, adding another food option NU students may not otherwise be able to access easily. Though Da Lobsta has two permanent locations in Chicago, the truck allows for more flexibility, food truck manager Luis Plascencia said. The business often seeks out events like Taste of Dillo to help spread awareness of the restaurant, he said. Overall, Austin said he was happy with the turnout at Taste of Dillo and saw it as a success. After Monday’s event, he said the tasting will likely be continued and potentially expanded in future years.